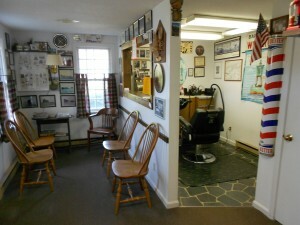 A Cape Cod Barber Shop. 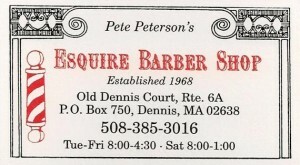 The Esquire Barber Shop and Master Barber, Pete Peterson, have been serving the Residents and Visitors to Cape Cod and the towns of Dennis, Yarmouth and Brewster since 1968. 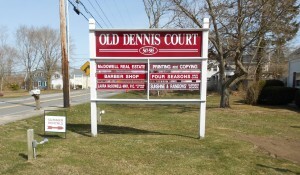 Located conveniently at Old Dennis Court on Route 6A in Dennis Village, the Esquire Barber Shop has Extensive experience in traditional, classic and modern haircuts for men. The Esquire Barber Shop is an old fashioned Men’s Barber Shop offering nostalgic decor, friendly service and today’s styles. Come in – sit down – relax – step back in time and enjoy! 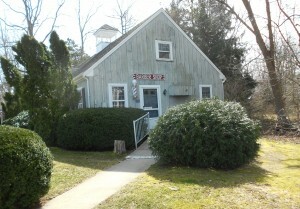 The Esquire Barber Shop is an old-time, traditional Cape Cod barber shop located on Route 6A, in Dennis Village offering haircuts for men. Walk-in service! 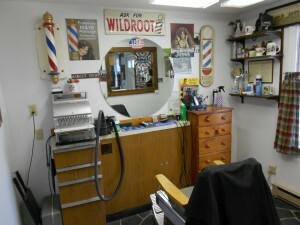 Come in, sit down, relax and enjoy the nostalgic barber shop decor.